CEC announced $57M available in 2 categories for upgrading food processing facilities in CA last month. Tier 1 supports demonstrating advanced motors and other devices and has awards between $100K and $3M; tier two supports microgrids and other renewable energy systems, and awards range from $2M to $8M. The food packaging business is massive in California. California Ag Today spoke recently with Rob Neenan, president and CEO of the California League of Food Producers, based out of Sacramento, about California food processing. “The League of Food Producers is a statewide trade association. Our primary function is regulatory and legislative affairs on behalf of our members,” Neenan said. The association represents about 50 food processor members across the state, most of the Central San Joaquin Valley, but it serves seven or eight members in southern California. “We have Del Monte in Modesto. We have Hilmar Cheese in Hillmar. In Lodi and Woodland, we have Pacific Coast Producers. We also have also some nut processors, dried fruit processors, so the whole gamut,” Neenan said. “There aren’t as many frozen fruit and vegetable companies as there used to be, but we have a few, for example, Del Mar Food Products in Watsonville and a couple of companies in the Merced area,” Neenan noted. The processing industry represents a big part of the power of California agriculture. “The annual output of the food processing industry in California is about $200 billion. About $25 billion is in direct value added on top of the ingredients,” he said. The food processing industry directly employs about 190,000 people. However, if you add in all the people who work in packaging, labeling, trucking, energy, IT, in support of the industry, there are 760,000 people in California whose jobs either directly or indirectly rely on the food processing industry, and that’s on top of the production agriculture component. It’s the third largest industry in the state regarding the manufacturing sector—only high tech and oil refining are larger in California. And Neenan explained that there are some significant issues that canners are facing. “The biggest is the proposed steel and aluminum tariff situation. The canning industry needs tinplate steel, which is also used in cans and aluminum foil, which is inside of some packaging as well. For the canneries left in California, this is going to increase their cost of doing business greatly,” Neenan said. The 10th Americas Competitiveness Exchange on Innovation and Entrepreneurship (ACE) is coming to Northern and Central California October 21-27, hosted this year by the University of California Agriculture and Natural Resources and Central Valley AgPLUS. ACE is an initiative of the Organization of American States (OAS) and the Inter-American Competitiveness Network (RIAC). It gathers high-level, public, private and academic decision-makers from across the Americas to explore thriving models of entrepreneurship, innovation, strategic investments and partnerships that contribute to economic development of selected regions. The Octobers ACE program tour of Northern and Central California will visit sites San Francisco, Monterey Bay, Fresno, Sacramento and Davis. About 50 delegates from throughout the Americas and other parts of the world will participate. Previous ACE host regions within the United States have included: Florida; Arizona and portions of Southern California; Georgia, North and South Carolina; and Central Texas. Internationally, ACE host regions have included: Ontario, Canada; Cordoba, Argentina; and the Mexican cities of Aguascalientes, Guadalajara and Mexico City. ACE convening institutions are the U.S. Department of Commerce, through the International Trade Administration (ITA) and the Economic Development Administration (EDA); the U.S. Department of State; the Government of Argentina; and the Organization of American States (OAS) as the Technical Secretariat for the Inter-American Competitiveness Network (RIAC). 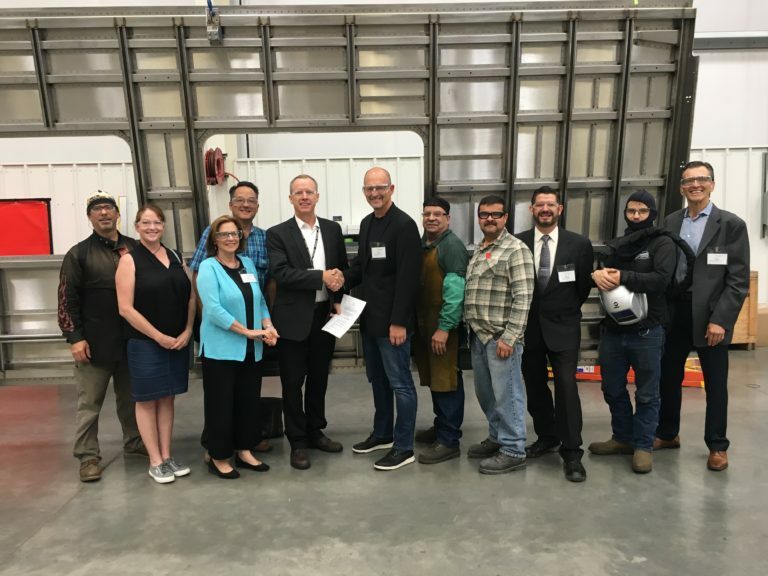 The Sacramento Valley Manufacturing Initiative (SVMI) is a new industry-lead collaboration to build and sustain a robust manufacturing sector in the Sacramento region by informing and supporting education and training providers about the needs of the 21st century manufacturing workforce. SVMI’s efforts will help address the chronic shortage of qualified and skilled workers in the manufacturing industry. While this may be useful for small talk at your next cocktail party, why is it relevant in a manufacturing blog? Is there an analogous conversation for rural manufacturing? If we said, “We are getting to know rural manufacturing,” would the witty, but correct, response be, “The only difference between rural and other manufacturing is that you can see more trees at lunch”? Luckily for us, there is a wealth of data on urban and rural communities in America, which helps us move the conversation from anecdotal to factual. One such piece of data is a report published by the USDA Economic Research Service, entitled “Rural America At A Glance: 2016 Edition”. This report analyzes the social and economic differences between urban and rural America, highlighting key differences such as urban and rural communities having differing population levels, costs of living, employment levels, median earnings, industrial compositions, and industrial dependencies among others. The information presented in the report is useful, and we recommend giving the study a look. The one piece of information in the USDA report that really stood out to us (for obvious reasons) was rural America’s dependence on manufacturing. When there are downturns in manufacturing the economic impacts disproportionately affect rural communities. Nearly 350 – 348 to be exact, or 17.8%, of rural counties in America are manufacturing dependent, and 70% of all manufacturing dependent counties are non-metro (rural). Those manufacturing dependent counties make up 22.5% of the rural population in America. And although the earnings gap between urban and rural manufacturers is large, median earnings for manufacturing is still the second largest in rural counties. These numbers are significant and highlight the importance of manufacturing to rural America. The better we understand rural communities and the industries they rely on, the more we can do to support those industries. The MEP National Network is in a unique position to both study and support rural manufacturing communities. The Network works with manufacturing companies in their local communities to enhance their competitiveness and reinforce their sustainability. As a result of these interactions, MEP Centers get feedback and data directly from companies, which informs our understanding of the industry and the communities in which they operate. This data was the foundation for a recent analysis of MEP Center’s rural clients done by the Manufacturing Research and Program Evaluation (MRPE) group of NIST MEP. The rural client analysis leveraged unique survey data from Center clients to examine the extent to which the program reaches rural manufacturers and what those interactions tell us. From this analysis, we were able to examine characteristics of rural manufacturers in terms of industry, size, challenges, and reasons for engaging with MEP Centers. The analysis also examined the extent to which rural manufacturers have outcomes similar to urban manufacturers. The results from this analysis were telling. There were significant correlations when looking at rural firms and some of the indicators which MEP Centers collect from their clients. The characteristic correlations are below. However, when assessing the magnitude of the impact and not just the existence of an impact, rural manufacturers delivered statistically the same level of impact and even higher amounts of additional investment. They might say “yes” less frequently, but they deliver equal or higher impact amounts. This is likely due to rural manufacturers being slightly larger on average compared to urban manufacturers. Rural manufacturers are, in fact, different. They don’t just have more nearby trees! The next question involves using this information. The MRPE group is aiming to leverage this data to enhance the Network’s service to and positive impact in the rural communities. A one size fits all approach does not work when trying to service unique companies and communities, and the more we can uncover this dynamic through data, the better we can inform our activities. This is not where our research ends, and we hope to use more community specific data to not only gain a greater understanding of the intricacies that make up the U.S. economy, but to also positively impact our economy. Valley Vision, the Federal Reserve Bank of San Francisco, and USDA Rural Development hosted over 125 people on January 30th, 2018 for a forum on the economic power associated with investing in regional food systems. Harvesting Opportunity: The Power of Regional Food System Investments to Transform Communities, was published in 2017 as a partnership between the Federal Reserve Bank of St. Louis, the Board of Governors of the Federal Reserve System and the U.S. Department of Agriculture. The book illustrates regional food systems as a tool for community and economic development; offers unique financing models and case studies of financial investments that are supporting today’s smaller food-related businesses and entrepreneurs; and profiles successful collaborations among the financial sector, government, philanthropy, academic, and others. Valley Vision board member Shawn Harrison of Soil Born Farms opened the meeting, followed by a welcome to Sacramento and Council District 3 from Sacramento City Councilmember (and beekeeper) Jeff Harris, and comments from Yolo County Supervisor and food access champion Don Saylor, who also introduced keynote speaker Kim Dolbow Vann, the new California Director for USDA Rural Development. Director Vann spoke about the need for increased broadband in rural communities, her office’s ability to facilitate communications and partnerships, and getting food processing and manufacturing “back to where the farming is.” She emphasized that our region has “transportation on our side” with easy access to rail, ports, and multiple freeways. The event was followed by a reception opened by Assemblymembers Anna Caballero (D-Salinas) and Cecilia Aguilar-Curry (D-Winters) who spoke as champions for rural communities including the importance of agriculture to our state and regional economies, economic development, and bridging the digital divide. Shawn Harrison and Managing Director Trish Kelly moderated the panels. Topics addressed in questions from the audience included the need for transparency in the investment community, how CDFIs and other investors make decisions to match lending tools with specific projects, and further conversation about the need for social equity in food system investments. Valley Vision will continue to work with our funding partners, nonprofits, and entrepreneurs to create real opportunities for people on the ground. As stated by Leilani Barnett of the Federal Reserve Bank of San Francisco in closing out the event, there are some very real projects that come out of these important discussions, and we will continue to elevate them. 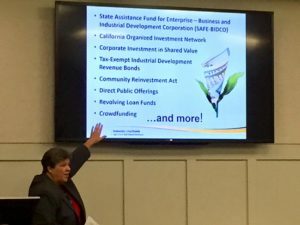 To enhance funding for food and agriculture businesses in the Central Valley, more than 60 people involved in small business finance gathered at the AgPlus Funders Forum Dec. 12 to contribute ideas. Representatives from financial institutions, economic development organizations, universities, government agencies and innovative funders like community development financial institutions (CDFI) attended. Participants shared innovative financing tools for business and discussed obstacles for people in rural communities to access capital at the forum at the UC Agriculture and Natural Resources building in Davis. Two primary challenges faced by people trying to start a new business are figuring out how to get started – such as their supply chain – and gaining access to capital to finance their endeavor, according to keynote speaker Glenda Humiston, University of California vice president for agriculture and natural resources. “There are actually an array of sources of capital beyond just the traditional bank loan, the problem is people don’t know about them or how to access them,” Humiston said. She added that much more capital could be available to Central Valley businesses if residents would invest locally. “If you had brought home just one percent of the retirement accounts held by people in the AgPLUS region back in 2010, you would have had over $1 billion to invest in this region,” she said. Marc Nemanic of 3CORE, Carrie Ellinwood of U.S. Small Business Administration, Ismael Herrero of Fresno State’s Office of Community and Economic Development, and Catherine Howard of Northern California Community Loan Fund discussed some of the challenges for financing new businesses and alternatives to traditional bank loans. Nemanic noted that many millennials are carrying student loan debt, which may make them averse to taking on more debt or prevent them from qualifying for business loans. Howard said her organization is creating a tool to help people satisfy collateral requirements for credit. To build their businesses, entrepreneurs often need technical assistance so Herrera’s office pairs young companies with experienced mentors and other services. Herrera said he is working to create public and private partnerships in rural communities, such as commercial kitchens for people to turn farm produce into value-added products to sell at farmers markets. Panelists pointed out that jobs in the gig economy, such as driving for Uber or Lyft, don’t provide the stable income that tradition lenders seek in borrowers so they need to create a flexible product. In the afternoon, participants split into four groups to focus on identifying opportunities for supporting economic development, supporting small business and microenterprises, effective intermediaries to connect investors with entrepreneurs, and regional finance funds. Each topic was discussed by a diverse group of people as peers and experts, bringing their own expertise to the table. To address the interplay between higher education, student debt and the structural changes in the nation’s economy, Meg Arnold, who moderated the session, said she could foresee policy implications. The discussions identified many other challenges for the food and agriculture sectors in rural parts of the state that need to be overcome to access capital. “We need everybody who participated today to share those examples of where something kind of unique or innovative is really working,” said Humiston. Ideas generated during the forum will be used to inform the work of the Central Valley AgPLUS Food and Beverage Manufacturing Consortium, which hosted the AgPlus Funders Forum. The information will also be used by Humiston to update the 2012 Access to Capital Report by California Financial Opportunities Roundtable (CalFOR). The report highlights financial needs for businesses in California, reviews financial tools and capital sources and provides policy recommendations. Humiston will also convey the outcomes to the California Economic Summit. 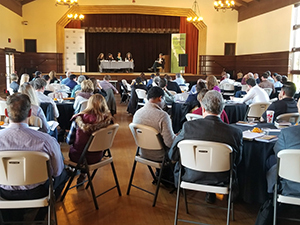 The AgPlus Funders Forum was sponsored by Chase Bank, Valley Vision, the Center for Economic Development, First Northern Bank, the Federal Reserve Bank of San Francisco, Employment Training Panel, Blue Tech Valley, Fresno State Community and Economic Development and UC ANR. Above: Glenda Humiston discusses funding sources that many people are not aware of. Sacramento, California. – The Governor’s Office of Business and Economic Development (GO-Biz) today announced a partnership with California Manufacturing Technology Consulting (CMTC) designed to increase the benefits for businesses that participate in GO-Biz’s recently launched ‘CA Made’ state labeling program for manufacturers. The partnership provides CA Made manufacturers with access to the statewide benefits of CMTC’s ‘Made in California’ program. “Since launching in 2011, CMTC’s Made in California program has grown to include more than 900 small- and medium-sized manufacturers. Through this partnership with GO-Biz and the CA Made program, we will significantly enhance the ability of California manufacturers to promote products that are made in California,” said CMTC’s President and CEO Jim Watson. A license to use the CA Made label on products, packaging, and point of sale merchandising. Placement of the product and company biography on the CA Made website. Information on services from program partners. Marketing via GO-Biz’s social media sites (e.g. Twitter, Facebook). Access to CMTC’s Made in California partnership benefits. For more information on CA Made, visit http://camade.ca.gov/. CMTC’s Made in California Program promotes California manufacturers, brands, and product lines through marketing, events, and business-to-business networking opportunities. CMTC is affiliated with the U.S. Department of Commerce’s National Institute of Standards and Technology and is part of the Hollings Manufacturing Extension Partnership (“MEP”) Program. Established in 2012 by Governor Brown, GO-Biz serves as California’s single point of contact for economic development and job creation efforts. GO-Biz offers a range of services to business owners including: attraction, retention and expansion services, site selection, permit streamlining, clearing of regulatory hurdles, small business assistance, international trade development, assistance with state government, and much more. Sacramento, Calif. – Today, the Governor’s Office of Business and Economic Development (GO-Biz) announced that the California Competes Tax Credit (CCTC) committee approved $69 million in tax credits for 90 companies projected to create 6,236 jobs and make $1.2 billion worth of new capital equipment investments across California. View the complete list of approved companies and award amounts. GO-Biz Director Panorea Avdis convened the committee, which includes Treasurer John Chiang, director of the Department of Finance Michael Cohen, and Senate appointee Denise Zapata and Assembly appointee Madeleine Janis, at the California Department of Food and Agriculture auditorium in Sacramento. In 2013, Governor Brown created the California Competes Tax Credit to focus on helping businesses grow and stay in California. Since 2014, GO-Biz has allocated $622.8 million to 865 companies projected to create 83,414 new jobs and make $15.7 billion in new investments. The California Competes tax credit is part of the Governor’s Economic Development Initiative (GEDI) which Governor Brown signed legislation to enact in 2013 (AB 93 and SB 90). GO-Biz evaluates the most competitive applications based on the factors required by statute, including total jobs created, total investment, average wage, economic impact, strategic importance and more. Companies are exempted from paying state income taxes in the amount awarded.